Replies: 107 (Who? ), Viewed: 30981 times. #1 31st Mar 2017 at 10:21 PM Last edited by Nilxis : 24th Mar 2019 at 2:31 PM. Hi! This thread is about the design and creation of Sims for Uranesia, my current CAW project. I'm fortunate to count with the help of talented creators for this project, and with @cyberzombieprincess' art as our inspiration for the Sims's clothing. 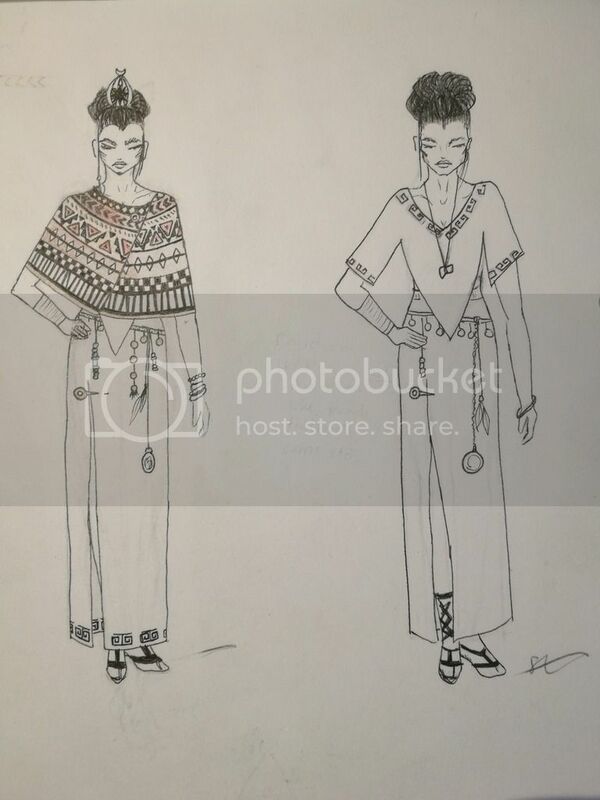 Our aim is to create unique sims who share common features, a common dressing style, and interrelated stories: everything linked to the semi-fantastic island of Uranesia and the cultures of its inhabitants. Some of the outfits/ pieces I showed in the YA/A category are aviable for more than this agegroup (mostly Teen - YA/A - Elder). That's it for now, we invite everyone to comment and share their ideas and feedback! Ooh.......new thread for sims.........might give it a try......I am totally horrible at making sims though. But yeah, I'll definitely give it a try. Might try my hands at doing a skin too. Let me play around, and then maybe I can share the results (( if something is salvageable, that is)). Hope you guys won't mind if I poke my nose into this ? #3 1st Apr 2017 at 11:19 AM Last edited by cyberzombieprincess : 3rd Apr 2017 at 6:41 PM. Reason: Spoiler note to reduce scrolling! Hi, look I'm still alive! And now I have more drawings for you @Furufuruu and everybody who wanted to see them ! Sorry for taking ages on doing them, it took longer than expected, sorry about that, but here you go finally! Truth be told, I have had my sketches ready for a few days, but I felt that I should wait with posting them until this thread was created, so here I am now with a total of four sketches! You have seen the male and female clothing, but now I also have childrens clothing and accessories! Without further to do, here they are! I hope you all like them as much as I liked drawing them! Note: When I made the details drawing, it wasn't settled that the skin would be gray, so I didn't do that, sorry sorry! Also don't mind my messy handwriting and thoughts, if anyone should want or need clarification on what something is (details, text anything?) Just let me know! Hope you guys won't mind if I poke my nose into this ? No not at all! Please do, everyones thoughts and sims are welcome, it is so fun that many people are so interested in doing this! I'm no sim creator myself really, because my laptop is so bad I can hardly run a sims game xD else I'd make sims too, so I just leave it to all the incredibly talented sim creators out there ! So if you want to create and share sims - you are welcome to do so! Accessory = WA , SPN, BASE . Accessory = SPN, WA, BASE . Also, I don't know how to do that fancy quote thing, but the sketches are awesome ! #5 2nd Apr 2017 at 11:22 AM Last edited by AussieMe : 16th Apr 2017 at 11:51 AM. Hi all! So I've said this before, but I've been following this project for quite some time now. I've also wanted to try out making some Uranesian's for quite some time, so uhh.. I did! But before I post any photos, I just wanna say that I absolutely adore everyone else's sims so far! Everyone has such different styles and it's so cool seeing them all! Also cyberzombieprincess's sketches are gorgeous, and I used them for inspiration. So basically I tried to take into account everything that Nilxis said about the features, and based mine heavily on his sims as far as colouring. But beware that I used a fair amount of cc when it came to the makeup, because one issue I find with really dark skinned sims (which this particular issue has been brought up before) is that features can be a little harder to see, especially when out of CAS, and a few facial overlays can make the face more visible. But I do understand that the final sims will probably have little to no custom makeup. I also have quite a lot of sliders installed, so this girly has been modified quite a bit. 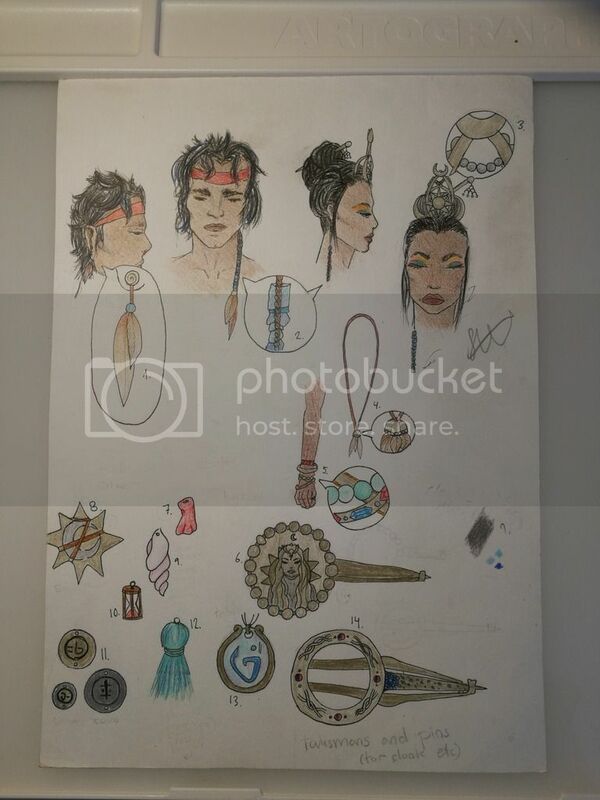 A picture of the face markings from Horizon Zero Dawn. Okay, well thanks for taking a look at my sim! I hope I uploaded the images correctly, I'm not used to this so sorry if I did it all wrong! #6 3rd Apr 2017 at 11:45 AM Last edited by Chihara000 : 3rd Apr 2017 at 1:07 PM. Thank you again for opening this thread, Nilxis. And it’s really great that so many people want to work on the new sims! @cyberzombieprincess: Thanks a lot for posting! I really love your designs! I wish we could convert this 1:1 into the sims. 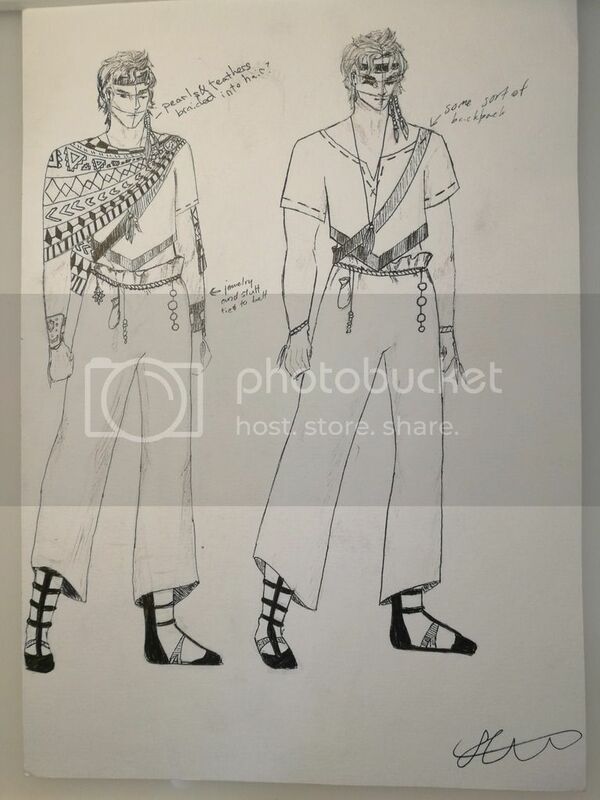 I love the idea with the braided hair (I actually tried to attach something similar looking to my new male sims - coming soon), of course the other accessories are great too. Sadly it will be difficult to find CC that looks alike (and we are restricted to max 15 pieces of cc) . Oh and I think the children design looks good too! – Similar to the adult one, but still different (I love the cape). About your outfits: It’s good to work with pattern and color, but maybe try to cut it down a bit Try using some more natural (monochromatic) fabrics or leather to break it up a little. @AussieMe: I like her - I get what you mean with the makeup. I used custom makeup for my models too. And you’re right about the face. A little highlighter works wonder. I like her tattoos (especially the one on the face). I think that the supernatural-veins could be considered part of the skin, but other marks (like your tattoo), are probably.. well tattoos. Part of their culture? Let’s wait what Nilxis has to say about this. About the images: It’s just a little advice, but I think it would be favorable to resize them a little (maybe 50-60%) and hide them under the spoiler tab. Omg thanks you for learning me how to mark stuff as spoilers xD and thank you for the kind words on my drawings!! Means a lot, I always get to nervous when I show my drawings to the world haha! #9 5th Apr 2017 at 12:05 AM Last edited by RylandHomes : 5th Apr 2017 at 6:19 AM. So I've gone ahead and worked on an Young Adult Male. I tried to stick with the flat nose, prominent cheekbones, thick eyebrows description, while also trying to keep the facial features seamless and as natural as possible. I used @Nilxis' design as a template, and @CHIHARA000's clothing guide. 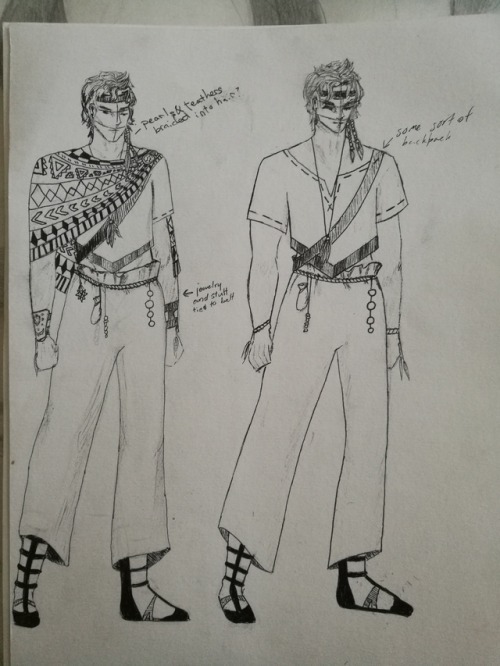 I figured the people of Uranesia could handle basic pattern weaving and material dye works, and with Nilxis wanting bright accessories and tattoos for the population, I came up with this guys shirtless outfit. I also noticed that Nilxis seamed to like the use of facial hair, and with my personal preference for Males, I went ahead and gave him some subtle chest and leg hair to go with his beard. I did want to clear some things up, @Nilxis, are we sticking with a pointed ear? Do you see Uranesian people as having curly or straight hair, or a variety of hair types? You liked the idea of having different hair colors to represent the different social status' of the population; have you decided on the correlating colors as of yet for either hair colors or clothing? I'm glad we're using sliders. I used some extra sliders in detailing the head shape, and made this adult male sim a bit taller, and improved his posture for a more confident, strong stance. I dont' have a name for him yet, but if he's widely liked, I hope to make him a small young family to accompany him. I'm not at all heartset on anything he has going on, and I'm open to suggestions and criticism. Let me know what you guys think! Out of boredom today, I decided to create an older, Adult brother for our unnamed sim. Now, they both need names and criticism. @Cyberzombieprincess I know you didn't create them with the intention to create actual sims, but out of inspiration. But now they are our inspiration and I'm really thankful! @RylandHomes : I love your first sim!! The second one is really nice too. I love their faces. (but there are no good alternatives if you want to add a bigger beard). I would love to hear their names and stories! So I created a few new sims, too. It’s the Nanuk family. It's a family of 5. The siblings look alike (more like their mother). Their outfits and accessories are mostly CC (for inspiration), same goes for the hair of course. Yuma is the head of the family and father of three children. He is a strong man, born in a family of hunters. Because the jungle is quite dangerous and not many people dare to enter it - the hunters have a good social status. Meat is a luxury item and rather expensive – so Yuma never had to worry about food or money for his family. But 12 years ago a tragedy overshadowed his life, when his beloved wife Drisha died. Drisha was a well-known healer, who took care of the poor. Her death was not only a tragedy for her family but also for the underprivileged citizens of Uranesia. Shania is the oldest child and had to take care of her younger brother and sister after their mother’s death. She is very responsible and has a kind personality. She married a hunter at a young age but her husband got killed by a beast in the jungle when Shania was pregnant with their child. So her son Toya never met his father. Ydran is the second child, and Yuma’s only son. He couldn’t live up to the high expectations his father had for him and often sees himself as a failure. He is bad ad fighting, riding or archery. Well, he may not be made up to be a hunter, but he is very curious about his surroundings and is quite smart and very kind. He is interested in the origin of Uranesia and wants to find out why the ancient civilisation disappeared without a trace. His little sister Bahna always encourages him to find his own way. Bahna is the youngest child and has a lot of energy. Unlike her brother she has a natural talent for horse riding, archery, tracking and fighting. She started accompanying her father for short trips in the forest at the age of 11. Now she sneaks out in the jungle alone or with her childhood friend Agus. – Even so her father forbid it. Yuma is proud of his daughter, but wished his son Ydran would have her skills and dauntlessness. Her sister Shania is a little worried that she might scare off the good men and potential husbands with her independence and truculence. Toya is Shania’s son. His father died before he was born and even so his grandfather Yuma tries to act like a substitute, Toya is missing the father he never knew. He always gets into trouble and plays pranks on everyone. Shania has her difficulties to manage him. He has a good relationship with his aunt Bahna but doesn’t get along with Ydran. Perhaps before we get too ahead of ourselves making sims, we need to collaborate and decide on what CC will be used in the making of Uranesian sims. @Furufuruu, we're eager to see the list you're working on. About the number of CC, I understand having more items would be useful, but I think 20 would be too much... There will only be pirates and "Uranesians" in the end, I won't create the separate community of farmers, I think it will be enough. Also, I don't want to use ITF or Store items either. Let's try with the 10-15 CC items for now, and we'll see if it goes well. Honestly, I would give priority to the other stuff, which is: clothing, accessories, skin, makeup, and hair (no particular order). Their outfits and accessories are mostly CC (for inspiration), same goes for the hair of course. Using custom hair, I feel like we should try to limit ourselves to no more than 4-5 different custom hair styles per gender, while also keeping in mind that we should be using custom hairstyles that could be used for multiple ages. @Chihaha000 I love Bahna's braids!!! I hope they're good for all ages. I honestly don't see too much of a need for custom beards, but if we do use a custom beard, we shouldn't need more than 2 or 3. The only thing I’m not a fan of (...) is the EA beard (...). It doesn’t really align to the sims face (but there are no good alternatives if you want to add a bigger beard). If a good alternative to a large beard could be found, that'd be great. EA's isn't the best, but I think it looks alright being that there isn't another non CC option. @Chihara000, to me, Toya is an ideal concept of what a Uranesian child would look like. His clothing is simple, yet colorful, his hair is practical, he looks great! About EA patterns, yeah many of them are ugly, but some are nice too, and there's lots of room for creativity. I really don't feel like we need any custom clothing, but that's just me. 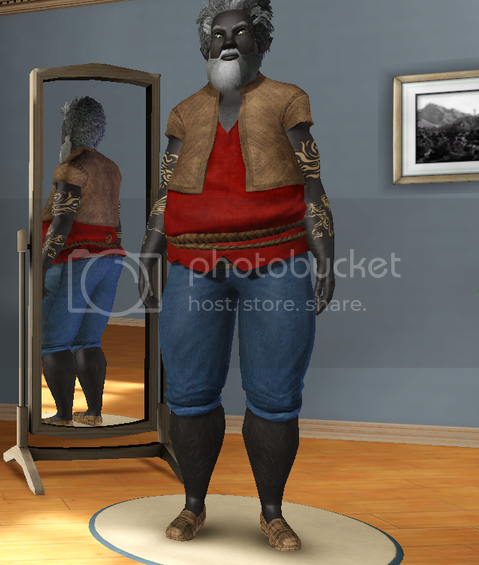 EA, in my opinion, has given plenty of options as far as taking a basic clothing article and using the CAStyle tool to really make it fit in any world. As much as I love to download custom makeup and hair, I equally dislike downloading clothing. However I understand some people may really want custom clothing included. Let's try to stick to the highest quality of custom clothing as possible. IMO anything that looks too much like a RL picture slapped onto a mesh shouldn't even be considered. @Chihara000 Shania's all brown dress is a good example of the kind of CC I feel like we should stay away from. I love Yuma's clothing, where did you download them? I wonder what @Nilxis will think about them. If it was up to me, I'd like to see a very minimal amount of CC make-up, and if we are using CC makeup, I'd prefer to stick more with facial paint and markings. EA has plenty of makeup options as well for highlighting and contouring. I really like @AussieMe's proposed concept. I also like the facial markings that @Chihaha000 used for Shania, very tribal like. They don't look veeery different, but the CC skin looks better overall. If you like it we can use this one We would have to ask Ephemera for permission though. I do like your edited version of that skin better than the EA skin. If we have permission, this could be a good skin to use. The basic EA grey skin is good, but I agree it has too much brown tones in it. Maybe even an edit to add just a hint of blue/green to the skin to cancel out the brown tones, without lowing the saturation, which in my opinion did get rid of the brown tone, but also made the skin seam "flatter" and less vibrant. It's difficult to maintain composure, and easy to jump the gun getting over attached to our creations, and even easier to take offense to someones criticisms when you spend so much time voluntarily putting a lot of effort into something. As with the redundancies @Nilxis goes through re-doing parts of Uranesia over and over again, so will those creating population for Uranesia. While we may all agree on something, it may not be what the creator has in mind. I want to stress heavily that while our work and contributions to this project are welcomed, and encouraged, the project is not ours to take over. In addition to our creations and contributions, our comments are also merely up for discussion, and no one but Nilxis really has a say so. I hope no one takes this as me implying anything towards anyone, because that is not at all my intention. I just want to make sure we're allowing Nilxis to feel in total control of their project. #12 8th Apr 2017 at 9:04 PM Last edited by Nilxis : 23rd Apr 2017 at 5:33 PM. Really Nilxis? You are not going to let me use these three items because they are ITF even if they are absolutely perfect, and I intended to make them base game compatible and for all ages? Well if you can make them base game compatible .package files (and for all ages would be nice too!) then it's fine, I have to admit that these items would look very nice in Uranesia What I don't want it people having to install ITF, or Store items getting attached to the world file. I’m still curious though as to what hair colors you like besides the white? I like dark blue and possibly green. Are you ok with the hair colors I used? How sophisticated are the dyeing and weaving methods of the Uranesians? What kind of beads and gems (ie resources) do they have access to? Those resources possibly being gems (multitude of colors), feathers (a multitude of colors), wooden beads (browns unless you’re thinking fantasy woods), pearls (varying colors), and bone (white). I think most of these besides gems would be more common resources on an island. I think exceptionally colorful accessories should be limited to certain Uranesians with wealth or access to such resources. The wood would be always brown, because there are no other wood colours in Uranesia, but about the rest of what you said, I pretty much agree. I would let poorer Uranesians use colorful accessories too, but in their case it would be painted wood or bone. When it comes to metal, Uranesians use 3 different kinds: a golden coloured one (valuable and precious), and two others which are common, and green/grey coloured. I will ask Ephemera for permission and if *he says yes, we will use that one, unless someone wants to recolour or create another one in the same style. could you share which sliders are you using? We should also make a common list of sliders and not go too crazy with the amount. @pannisim, your sims don't look that bad, it's a nice start! I like the jewelry I agree with Chihara about the patterns though. @AussieMe, thanks for joining in too! Your sim looks so beautiful, great job I have to say though, that her facial traits are a bit too soft compared to the sims of the others, maybe it would be good to exaggerate them a bit so the sims look more similar, but that's a really nice start too. I love the idea of the face markings! About the veins, Chihara is right: they are natural skin marks and everything else is cultural body decoration/modifications. 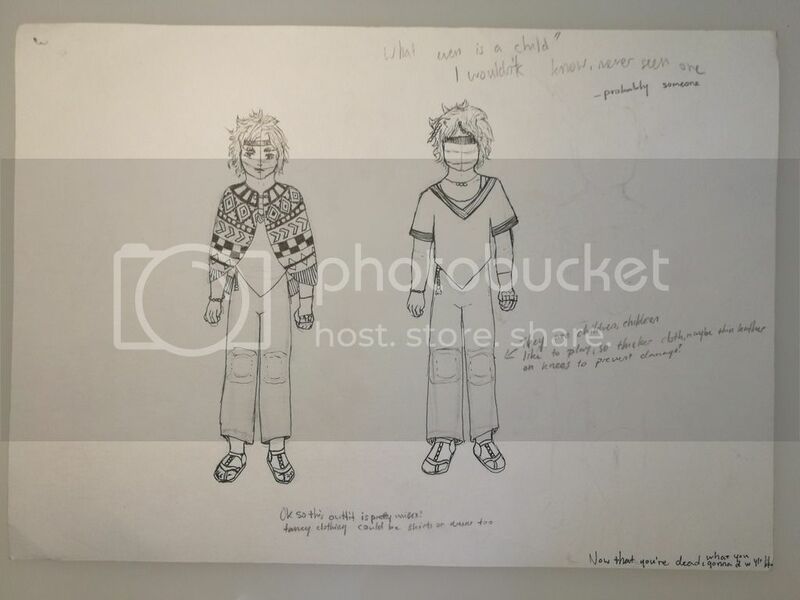 My goal when I do those charachter drawings, is to aim for something that could be worn in real life, yet stay close to the fantasy like feeling? For the children, I thought that maybe they play on the Uranesian rocks or in the woods, if they are allowed to? Nice idea! I would say children do play in the nature, but never too far away from the city. @RylandHomes, Great job too! You really captured the Uranesian essence I'd love to see more of your sims for sure! I did want to clear some things up, @Nilxis, are we sticking with a pointed ear? Do you see Uranesian people as having curly or straight hair, or a variety of hair types? You liked the idea of having different hair colors to represent the different social status' of the population; have you decided on the correlating colors as of yet for either hair colors or clothing? @Chihara000 and @RylandHomes, I agree with Chihara about the big EA beard. I wouldn't make Uranesians too hairy and bearded, at the most like your Yuma. @Chihara000 Now about your sims, OMG. I seriously love them, and their stories! The outfits look great, and I really like how you used the patterns and the colours The makeup and the accessories are also amazing. I love everything! Oh and btw, what skin did you use for your sims? It doesn't look like the EA one, did you recolour a custom one? Because it looks gorgeous! to me, Toya is an ideal concept of what a Uranesian child would look like. His clothing is simple, yet colorful, his hair is practical, he looks great! I agree it looks a bit flat. What do you think about the skin Chihara has used? It has a very slight hint of purple (does everyone else see it too? ), which doesn't "break" the grey tone. I think it looks great. This pretty much summarises what I think, thanks for expressing it so well And I also agree with your other remarks on CC, now I see we may need to enlarge the list to 20 items. I'd love the see the items @FuruFuruu has compiled, so we can discuss it and eventually create the "official list" as soon as possible so we have a base to work on. Thanks again for expressing stuff so well I think it's important to comment on this. While I'm in almost total control of the building and CAW process, I feel like in this process of creating sims I'm somehow handing a little part of the "direction" of the project to you, which means you have a lot of freedom to let your creativity flow. But, as you say, it's important that everyone understands that this is a collaborative project, we're not creating sims just for ourselves and that might feel a bit limiting to you. Especially now at the beginning, because we have to clearly define which CC and game items are we allowed to use, and some guidelines about style, genetics, etc. We need to work together, and that means we have to put some restrictions in order to create sims who look like they belong to the same ethnic group. I might be a bit picky about some stuff now at the beginning, but once we have definied all the guidelines (I believe right now we're very close to it), I will be just posting my ideas and suggestions like everyone else. You're putting a lot of effort into this, and I want you to feel part of the project and feel that you have power to decide. I'm asking everyone who wants to collaborate to keep this all in mind and be open to criticism, suggestions and ideas, about anything, and I include myself too. Everything is debatable! I think that we can get something very nice from this collaboration So, with this in mind, everyone is welcome to join and share their ideas and sims! I think that everyone who has posted so far understands the "spirit" of this, your comments and sims prove it I just felt it was important to clarify this in case there's the new simmers who are thinking about joining us. I'd like to say too, about your stories, I really like what I've read so far, but I can't guarantee I can include them just as you've written them because the world is not finished yet and there are many details of the Uranesian society I still haven't thought about. I'll try to, though. I will ask Ephemera for permission and if she says yes, we will use that one, unless someone wants to recolour or create another one in the same style. Oh and btw, what skin did you (@Chihara000) use for your sims? It doesn't look like the EA one, did you recolour a custom one? Because it looks gorgeous! If Ephemera says that we can use her's that'd be great. If not, we could use the one that @Chihara000 used, that one does look lovely also! I use sliders found here at MTS. I also use the grow mod, which adds a slider into the head shape. Good, I'm really glad you don't like the pointed ears, I didn't care for them either. Also, good to know you want to include gods into the world! How many? What are their roles? What do you picture them looking like compared to the population? Are they significantly larger beings? What do you see them wearing? About the hair, I would go with straight and wavy hair, but not curly, and then a variety of braided/weaved hairstyles. About the colors, I don't have a clear idea but how about this: white/grey and dark blue and green for lower and middle classes, and dyed dark purple hair for the higher classes. I like this concept... a lot! Being a hair stylist, I love that this historical concept of cosmetology will be adapted to Uranesia, very exciting! What do you think about your Gods having shimmering golden hair? That would be pretty, and god-like. And for clothing: predominantly red purple and golden tones for the high class; and for the rest of classes, all colours as long as red/purple/golden are not the main ones. I don't think this is a bad idea! 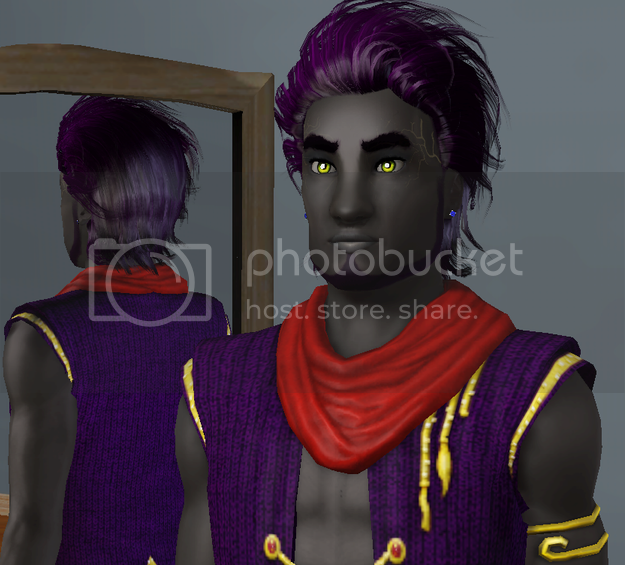 I'm gonna play around a bit in CAS working on a concept for a high class sim, because I'm curious to see how purple hair and predominantly purple clothing will look together. Broken up with accents of gold, I'm sure it will look nice. I'll post pictures of what I come up with. I wouldn't make Uranesians too hairy and bearded, at the most like (@Chihara000's) Yuma. Good to know! 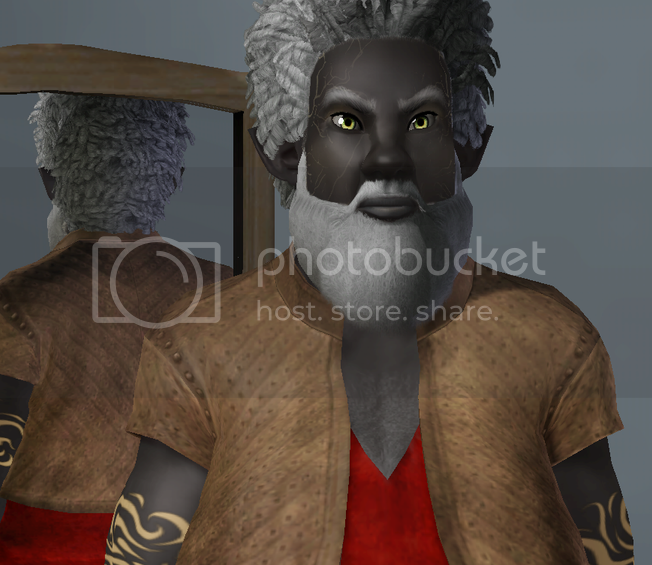 I didn't know how bearded or hairy you expected male sims to be, just figured to make the big guy bear-like. That was another question I had, how fit is most of the population? I wanted to make a larger sim to see how you felt about weight? Do you plan to include a diversity of body shapes? Or would you rather them all be pretty slim? Let's try to stick to the highest quality of custom clothing as possible. IMO anything that looks too much like a RL picture slapped onto a mesh shouldn't even be considered. @Chihara000 Shania's all brown dress is a good example of the kind of CC I feel like we should stay away from. This pretty much summarises what I think, thanks for expressing it so well And I also agree with your other remarks on CC, now I see we may need to enlarge the list to 20 items. Well, do you think we should try to keep to 15 for now, just because it'd be better for users who didn't want CC to begin with? I feel like the accessories is where we may want to start increasing the amount of CC. I definitely don't think we should exceed 20 items though. Okay, so I've made a slight edit to the first sim I made, trying to play around with the hair color, and do away with the pointed ears. I gave him a name too, Turik. I have also made a female sim, young adult, no name. I used green for her hair to represent middle class, and just threw her into some clothes that looked okay for now. For her hair, I used the braided "Yolanda" style in this set found here at MTS. #14 13th Apr 2017 at 4:19 PM Last edited by rkm28 : 13th Apr 2017 at 5:19 PM. Ahh I NEED to sort my laptop out so I can get up in all this sim brain storming action! I have been sat reading through everything on this thread and from the Master Uranesia thread and agree that this is very much @Nilxis' baby, but I am loving all the collaboration going on to help find the Uranesian's core look. Firstly I LOVE the idea and look of the dark grey skin and love what Nilxis has done with Ephemera's skin (imo Ephemera skins are the elite benchmark of the best skins for ts3). I know a lot of cc skin creators have used Ephemera's skins as a base and edited them including Ephemera in on the cc credits list. 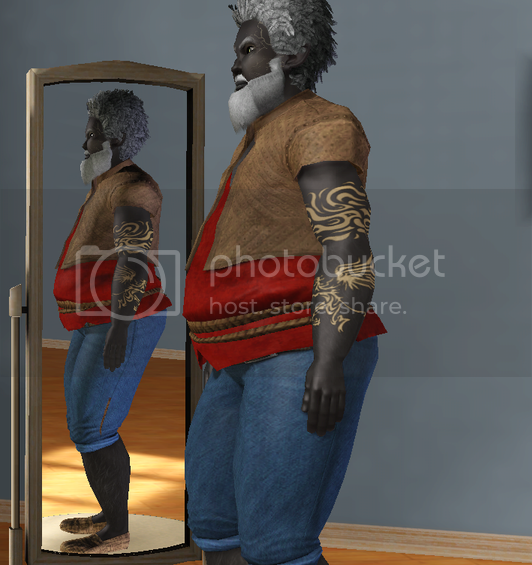 I have also found in my search for a grey skin this one here on MTS http://modthesims.info/d/440794. They have a number of different colour skin options, but its the grey one that caught my attention. 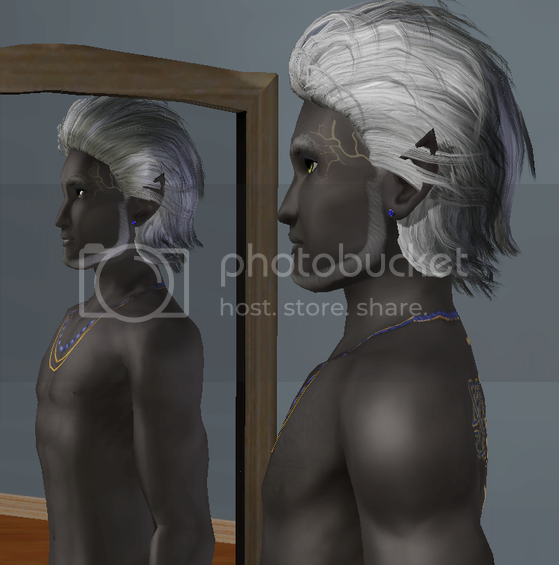 Hoping I can get my laptop working with the sims 3 this evening and I have already downloaded it to try out as a skin base for my Uranesian offering and I have also downloaded Nilxis' Uranesia lighting MOD as well to try out the colour combinations. I also like the skin Chihara000 used as well, definitely a great alternative option! I love the idea of the different colour clothing schemes for the different classes too. However, my only concern with this is there is too much "darkness" in the colour ranges being discussed especially for a tropical climate (although dark green, blue, red or purple died hair could be interesting). Dark clothing colours attract heat, light colours repel them and having so many dark colours is just not practical in a hot and tropical climate. My thoughts woulld be to keep the colours mentioned for each class but maybe to lighten the colours a bit or make them brighter rather than darken them. Alternatively use those colours to accent the clothing (as in the case for Toya's cream and blue outfit). I love the idea of the colours chosen for each class though. My only change would be for when you get to the Royal and Upper class Uranesian sim have them with the darker purple hair (Royal) or red hair (Upper Class), but maybe wearing white and gold with accents of purple/red and keep the colours worn by the lower ranking Uransians the same colours for that class level, but make the colours bright or accent colours with beige being the predominate colour as in Toya's outfit; just a thought though. On the beard/facial hair question. I don't see Uranesian men being particularly hairy. I like the idea of them being a little like a lot of Native American men (sans facial hair or minimal stubble at best). My dad is half Native American and he has less body hair than I do and it takes him a week to get a 5 o'clock shadow! 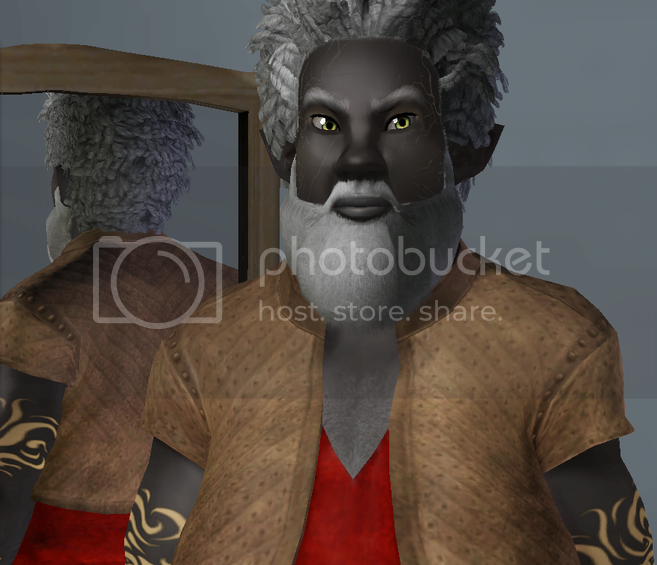 FuruFuruu's wonderful sims reminded me a little of the Native American features, which is what made me think that the Uranesian men would be less hairy looking too! On the subject of CAS patterns. If I'm honest personally I'm not a fan of EAs pattern offerings, but I'm going to give them a go in my Uranesian sim creating. I also love the idea of making their facial features more striking and angular with the flat or pointy nose and I'm also not so keen on the pointed ears either. The Gods maybe, but not Uranesian sims in general. I'm a complete CC junky so its going to be hard for me to keep the CC used to a minimum, but I'm going to look at it as a challenge (Nilxis has thrown down the gauntlet and I'm going to accept the challenge ). 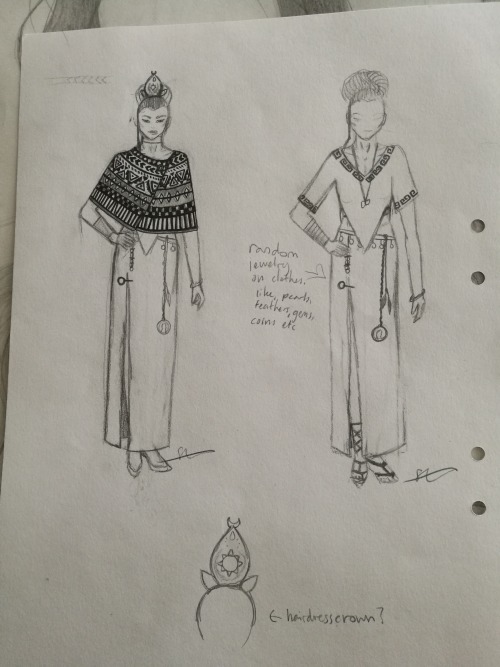 I think EA do have a few good clothing options that I think will work for Uranesia and I agree that maybe the accessories could be where we really go to town on. I have a 2 CC creators in mind for that too! I hope to show you later on my sims. I will also list what CC I've used and also what sliders I use in creating my sims as well. But I also agree that any CC that is used really should be perfect for Uranesia and should compliment all Nilxis' hard work and do it justice! I would also like to add I love cyberzombierprincess' sketches as well and some of the ideas I have for my Uranesian test sims is trying to work towards those sketches with using minimal CC. My gosh, just look at this gorgeous thread. I just want everyone to know I haven't forgotten my duties!! I had a calculus test that ate two weeks of my life. CC list (already done) and slider list coming up. I'll be working on pulling together my post. There is so much I want to say. Can't wait to comment on all the beautiful sims you guys made, Yowza! Hi guys, sorry for the late reply! I sent a private message to Ephemera some days ago but there's still no reply, his last activity was on 2013 so I think we may not get a reply, ever. Do you think it would be ok to use it anyway, including Ephemera on the CC credits, as @rkm28 says? The skin Chihara used looks nice too! Also, good to know you want to include gods into the world! How many? What are their roles? What do you picture them looking like compared to the population? Are they significantly larger beings? What do you see them wearing? Lower Class = Non dyed hair (White/Grey) Middle Class = Dark Blue & Dark Green Higher Class = Dark(Royal) Purple I like this concept... a lot! Being a hair stylist, I love that this historical concept of cosmetology will be adapted to Uranesia, very exciting! What do you think about your Gods having shimmering golden hair? That would be pretty, and god-like. I'm not sure about making a clear difference between lower and middle classes, I explained it a little bit in my latest post on the other thread. I would make white/grey, dark blue and dark green the natural colours, just like we have blonde, black, brown, etc. And then the purple dyed hair for the higher classes (very few people). I do like the idea of giving the gods golden hair! A diversity of body shapes would be nice! It would depend on the lifestyle of each sim, I guess. Farmers or hunters would be generally fit, while sims with other professions that don't require much physical activity could be slim, or large, or something in the middle. Now, about your Sims, they look fantastic! I really like the colours and the features you've given to them, great job The only thing I would change, is the colour of the veins in the face, I would stick to just one colour for all the Sims, my preference is light grey but, like everything, we can discuss it. 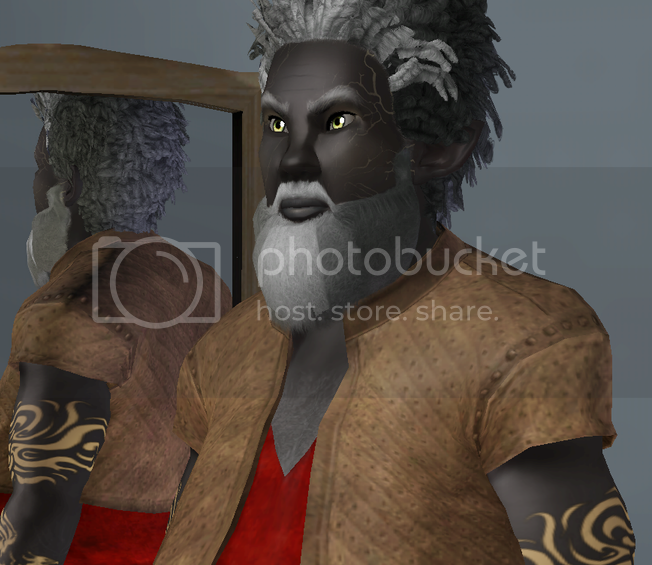 I have also found in my search for a grey skin this one here on MTS http://modthesims.info/d/440794. They have a number of different colour skin options, but its the grey one that caught my attention. On the beard/facial hair question. I don't see Uranesian men being particularly hairy. I like the idea of them being a little like a lot of Native American men (sans facial hair or minimal stubble at best). About CC, let's see what @FuruFuruu has prepared, but yes, the top should be 20 items in any case. Please be on the look out. Recent changes are indicated by asterisks*. Ok, now that that is out of the way. 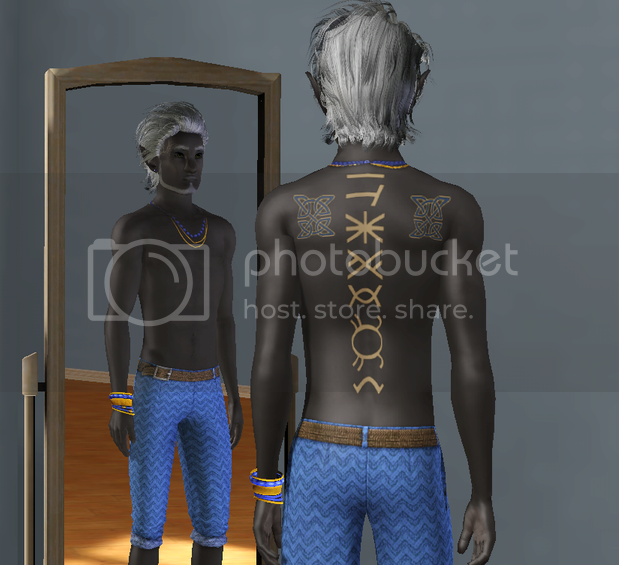 *All tattoos on my sims are EA, however, I forgot to add that I use XCAS, a core mod which extends tattoo locations. RylandHolmes, mentions this in a later post. XCAS is not compatible with Awesomemod as both are core mods. XCAS is however compatible with NRAAS. You guys can download it if you want, but I'm hesitant to put it on my official list because it's a core mod. You guys can vote on that. This list is a work in progress. I intend to update it as we all make changes. *Please note sliders are not a necessary download. If a sim uses sliders you do not have, they will look the exactly same in your game. Again, whether you have all of these sliders, some of these sliders, or no sliders at all, all sims genetics will look identical in all games. I am providing this list for simmers who want to have an easier time making Uranesians. Or people who want to alter Uranesian's genetics in CAS. This is a biggun, but I will provide two lists. One of every slider I have used thus far, and the other is a “lite” version for those who just need a basic set of tools to aid them in making Uranesians. In order to override EA’s slider limit (Number of total sliders as EA only allows 25 sliders per section), I have Twallan's NRAAS Master Controller installed. Awesomemod also allows you to do this. NRAAS Master controller is a core mod but it is not like Awesomemod. Your game will not be damaged or changed in any way if you decide you don't like it and uninstall. I also have the slider max (the degree of which you can move the slider) in NRAAS set to 3 (which is pretty modest all things considered). For those of you who are new to sliders and have any questions about NRAAS and sliders please feel free to ask me, as I am happy to provide instructions on how to navigate NRAAS. Again, I will be updating this post when I have links to the sliders. *A folder of all the sliders is available for download below. Hi @FuruFuruu, thanks for the list! About the possible CC, yeah we could use some custom makeup too, nothing too "tribal" or extreme though. That would be great for the inaccessible island, which will be a separate world. Now, I don't see any custom hair on the list, do you all thing we should include some? I think it would be nice. #19 9th May 2017 at 2:52 PM Last edited by FuruFuruu : 9th May 2017 at 3:05 PM. I am absolutely ashamed I haven’t commented on your last 2 Uranesia updates. I have to go do that next! I don't know how many gods I want yet, around 15-20 maybe. And I haven't thought much about their roles, but my basic idea is that they represent natural and human elements, similar to the Greek/Roman gods. About their looks, I haven't thought much about it either, but I like the idea of them being larger beings, and having different features than those of humans. This is where we can go super crazy with color! I like the idea of gold hair, but let’s not just do gold let’s do all kind of crazy!! Ok, I need to calm down. I was so excited when I read this, I even looked up a few CC items that could be usable with gods (I added it to my updated list)! Got you, duly noted! But I do want to say when I was speaking about dyeing and weaving I was referring to clothing. I touched on it a little before when I was sharing my opinion with Chihara about how I think zippers are too modern. Something like lace for example, although I don’t think lace is modern, I don’t think it would fit because cyberzombieprincess’ clothing style has more of a knitted or woven look. Hand weaving and knitting is extremely time consuming (anyone who has ever knitted knows this very well). Additionally, I feel like to have all three things at one society’s disposal ie knitting, weaving, and lacework would be rather modern. The same thing with colors in some instances. For example something like plastic is easy to produce in a multitude of colors, but most natural materials don’t have these kind of vibrant colors and those that do are rare and coveted. So what people can do with dye other natural materials, is not the same as what one can do with paint or plastic, our more modern cheaper counterparts. That’s why in my other post I offered the opinion that colors should be considered especially with accessories. I know this is a fantasy world, but I just think the technological level of the civilization, class, environment, and natural resources should be taken into account. I sent a private message to Ephemera some days ago but there's still no reply, his last activity was on 2013 so I think we may not get a reply, ever. Do you think it would be ok to use it anyway, including Ephemera on the CC credits, as @rkm28 says? Yeah, I don’t think you’ll get a reply . You said you’d credit him so I think it’d be ok to use it. About the possible CC, yeah we could use some custom makeup too, nothing too "tribal" or extreme though. That would be great for the inaccessible island, which will be a separate world. I totally agree %100 about the tribal thing! I really can’t wait to see this inaccessible island. I know it’s far off in the future, but it just sounds so crazy interesting, I can’t help but be hopelessly intrigued. Now, I don't see any custom hair on the list, do you all thing we should include some? I think it would be nice. I just updated the list again. I know you already know how I feel about custom hair lol, but I’d be more than happy to stake some out, although I’d think RylandHomes and Chihara000 would be better suited for the task. I’ll make sure to update it to my post if any suggestions come along. About the sliders, wow, that's a lot. Yeah I know… I’m sorry, I really tried. I can’t help it. We can definitely create a merge file as an option! Slider file sizes are extremely extremely light. This would be no problem at all. Of course, I will have them all clearly listed separately as well to avoid anyone getting duplicates, but I can create a merge file as well no problem. I will get on that! I don’t know how you did it, but you did it again! And with color!!! When I saw your sketches I lost my mind. I couldn’t stop yelling and talking to myself lol. Seriously surprised I wasn’t institutionalized. I don’t understand why someone can’t make every single thing you drew? It can’t be that hard, can it? Please someone? Every accessory is so unique and well realized. You have an assortment of shells, beads, pearls, and feathers that reflect the environment. The sun and moon motif that Nilxis has integrated into his world is clearly expressed in your accessories. And you even have what looks like currency. Madness. My favorite accessory is #14. I really thought it was going to be the crown until I saw that hair pin. Again, why can’t somebody make this?!? The child is so adorable and just perfect with the cute little braids in his hair. And you kill me every time with the shoes. The shoes. Ugh it’s just too much. The shoes are perfect in every way. They match the environment, they are simple yet stylistic. The male’s shoes are by far the most perfect example of this eclectic mix of culture yet simplicity. Look at the shoes you guys, just look at them?! All I can say is thank you so much for doing this, for being such a huge part of this creative process, and that I’m so proud to call you an inspiration and even prouder to call you a friend. Before I begin, I want to say you should be very proud of your sims. Don’t lose confidence! You worked very hard on them and it shows. I think you have the right idea about color, but I think it would work a lot better if you focused on one article of clothing so that the colors would shine more. For example on the teen, the blue and green (my fave of your color combos) would look really nice if the top were just that color. Perhaps make the skirt a solid muted color, and if you want to continue to use that color scheme add something in that color family to the belt on the skirt? I think that would go very nicely with what you did. On the adult I’m not really a fan of the pattern (EA patterns -___- are there really any “good” ones lol? ), but I do really like the grey and yellow color combo. The clothes are distracting from the thing I find most fascinating about your sims; their beautiful faces! Despite you thinking that your sims’ features are “a big mess’” I find myself liking most the very thing you’re criticizing. The bone structure of both of your sims is quite beautiful and unique. My eyes just keep gravitating to both of their faces. The only thing I think that needs changing is the eyes should have an epicanthic fold and perhaps give them both a more defined nose. But the bone structure is fascinating Panni! You did a lovely job, truly. I love the color scheme and the pattern you used for dressing you sim! Your sim is like a classic kind of beauty. But I do agree with Nilxis she does look very soft. I think if you made a more rugged nose or tweaked the cheekbones she would fit just perfectly. I wish there was a slider that extended cheekbones diagonally upwards below the eyes. Do you know what I mean? Boy, that would just push her over the edge. 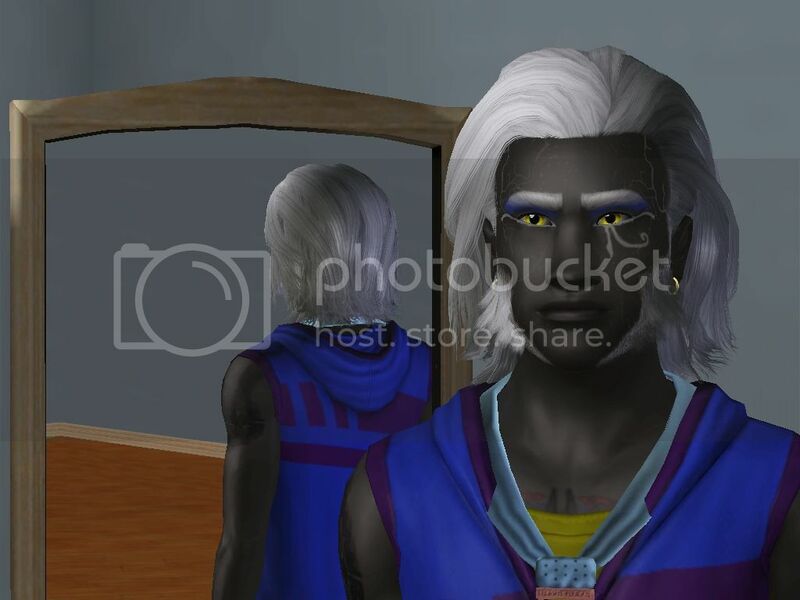 I agree with you about makeup on dark sims. It’s a skin problem really. 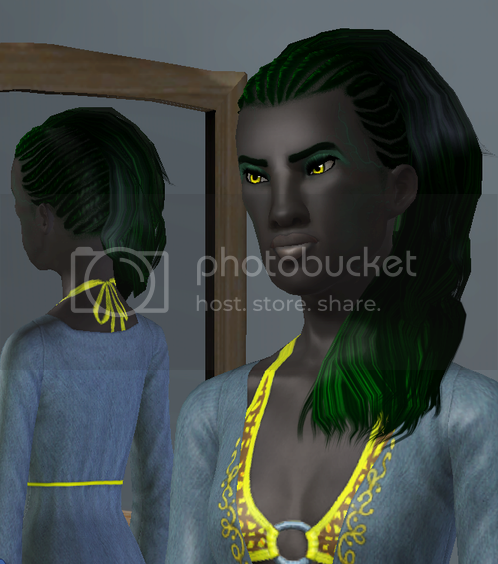 I think sim creators really have a hard time blending dark skins. A lot of the skins just don’t focus enough on details for dark sims and they can look washed out. There are some really nice detailed ones out there but they are mostly for “human” sims. And I love your idea about facial paint/tattoos! I like Horizon Zero Dawn’s face paint/tattoos but I think the face paint should be more delicate and simple, much like what you have on your sim. Your female sims facial structure is spot on! She looks amazing! Just look at her?! I love the color of her eyes, I love the color of her hair, just absolutely beautiful! 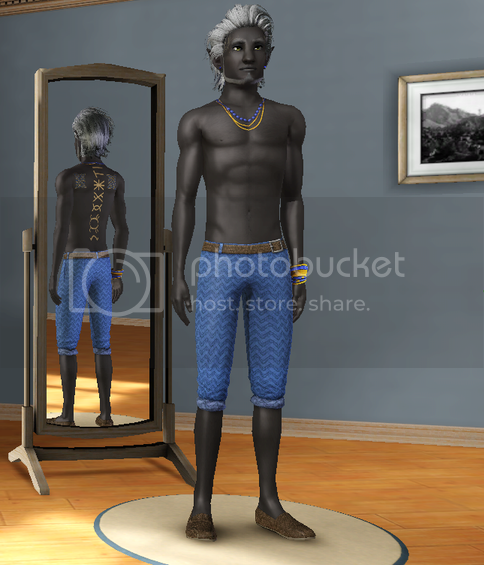 Your first sim (Turik) is quite handsome (I like him with white hair better), kinda’ reminds me of Aladdin lol. I like that you went with more simple colors and patterns. Weaving and dying takes a lot of man power, resources, and skills. I think what you did is a truer representation of an advanced ancient civilization. I love the tattoos you chose, but I have one teeny suggestion to make them perfection. Turn down the opacity a little. I find when I do a higher opacity sometimes that tatts will look more like body paint instead of tatts. It’ll make them look even better, trust me! Wow. Just wow. Your sims are amazing. I am just blown away. The sims, the clothing, the colors, the patterns, the stories, just absolutely amazing Chihara. You have inspired me to do better. To knock this out of the ballpark like you. You have completely captured cyberzombieprincess’ style. The only thing “negative” I have to say is about some of the clothing: the climate issue Nilxis brought up, and the mesh that RylandHomes mentioned. I’m tempted to just hand the whole thing over to you. You surpass me in every regard Chihara. I loved your sims before, but this is a whole-nother-level of goodness. Amazing. I can’t wait to see what you do next. I know I've been very tardy posting the screenshots of the sims I've been working on. Was still having problems with my CAP when I was working on my sim offerings and then got side tracked with my Villandry build. I'll post the screenshots here a little later though as I'm not at home at the moment. But please bare in mind they were works in progress and weren't really finished! They will though give an idea on some of the CC that @FuruFuruu mentioned. I'm glad to see @FuruFuruu added some of VenusPrincess' Carnival Accessories into the list of CC as those are the CC I've been working on with my sims along with some from Murfeel. Also I would add all of BEO's White Collection items to the list not just the draped top as the skirt would be an excellent addition to the clothing list for female sims: https://www.thesimsresource.com/downloads/details/category/sims3-clothing-female/title/draped-top-01/id/1263964/. 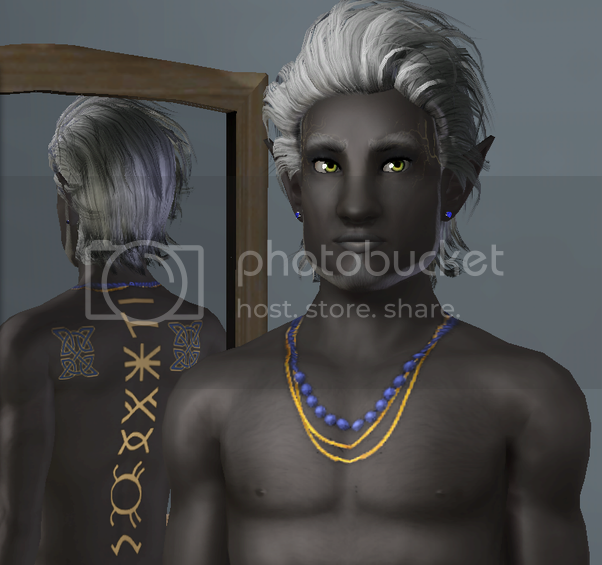 I also used simplykitsch's Vallaslin's 6V chin makeup as natural markings for the sims as well. I can definitely agree that adjusting the opacity of the make up for skin markings and tattoos really does improve the look of them. https://www.thesimsresource.com/artists/Gosik/downloads/details/category/sims3-sets-clothing-female/title/suede-gladiator-sandals-/id/1019303/ (Gosik has these for Teen, YA & Elder female sims). @Nilxis you were right about the skin I posted it was not nearly dark enough sadly even on the darkest setting. I used the "brushed metal" skin which wasn't shiny, but I know it's not dark enough for what you wanted with your Uranesia lighting mod, but you'll see it when I post the screenshots later. The sims I was in the middle of creating were the Royal sims or potentially the Gods of Uranesia and their guards. Wanted to try and do some sims of all the different classes. 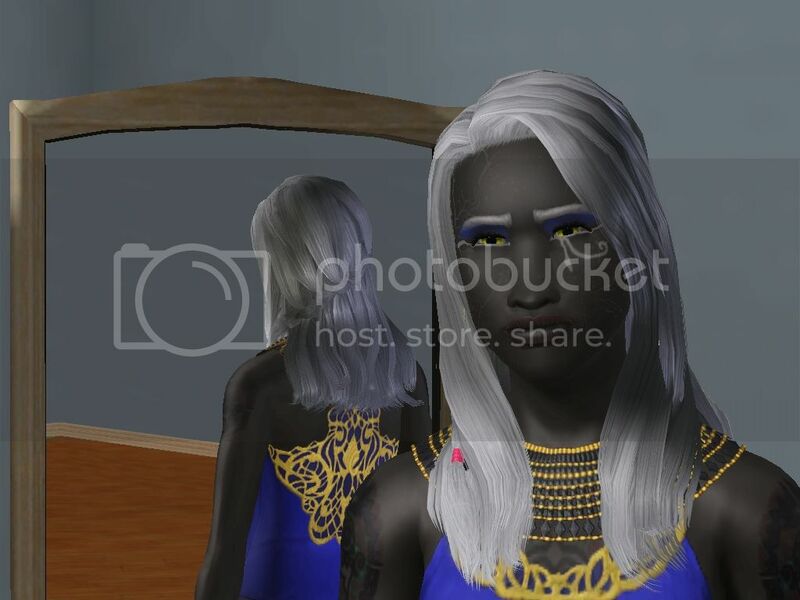 @simmyRN funnily enough there is a metallic skin http://modthesims.info/d/440794 I posted that link further up the thread for @Nilxis to look at for the grey skin. It doesn't go dark enough for the Uranesian look that he was after, but that skin comes in two different types 'brushed metal' and 'shinny metal'. I only looked at the brushed metal in grey at the time. I still have to add screenshots as I didn't get time when I got home last night. But I have to admit I love the idea of the Gods having a metallic kind of look to them to make them stand out a bit and be a bit different from the Uranesian sims, but it would be down to @Nilxis to decide the final sim design look, but I can try and do a mock up sim with the gold skin for approval with the look of the Guardians of the Galaxy 2 about them. #23 10th May 2017 at 3:27 PM Last edited by Chihara000 : 10th May 2017 at 4:27 PM. I’m terribly sorry for not replying for a while. I was busy working and moving. I don’t have that much time now, so I make it quick (who am I kidding? It's gonna be a long post again). Thanks for your compliments about my sims! This makes me very happy. (@FuruFuruu: But I really don't think I surpass you. I totally agree with that. It’s not the end of the world if our sims aren’t used for the project in the end. - But I’m also glad that Nilxis gives us a bit of freedom and the room for discussion here. Like I already said: I love your sims! The edited Turik with purple hair looks nice, but in his case I would prefer the light grey hair version. It looked better on him I guess. But that’s only my personal opinion. Your female sims looks really great too! I’m not a fan of green hair in general, but it kind of suits her! I also really like hair facial structures. Looks awesome. IMO anything that looks too much like a RL picture slapped onto a mesh shouldn't even be considered. @Chihara000 Shania's all brown dress is a good example of the kind of CC I feel like we should stay away from. ahm..yes I agree with you 100% and I seriously don’t know why I put this monstrosity on her. I probably liked the shape… I guess. I love Yuma's clothing, where did you download them? As far as I remember they were conversions. But I’ll try to find out where I got them. I think the second (and third – it’s the same) one could be from the TSM conversions. hmm yes I actually thought that too when I created him, but I really liked those outfits so I dressed him like that anyway. About the climate: So it’s like a earth-like tropical climate with hot days and warm nights and high humidity? In this case the clothes are really too thick I guess. I also like the facial markings that @Chihaha000 used for Shania, very tribal like. Thank you! I really like this face mark too. I hope it’s not too tribal for Nilxis. I already posted a link to these marks for FuruFuruu in a previous post and she included it in her CC list, too. I found the skin within my CC skins, I downloaded them ages ago. And I have a lot.. The said skin has no custom thumbnail so it’s not that easy, but I’ll try to find out whose skin it is! @rkm23 I agree with Nilxis here. The grey skin from your link looks a bit too shiny to me. But finding grey skins aint easy. But maybe the golden color option would be nice for a god? And about Ephemera: I guess he(?) moved on. I don’t think he will have a problem with us using his skin (as long as we give him credit of course). BUT: I don’t think many sliders are that much of a problem, after all you don’t need them installed and they aren’t very big. I also always merge my sliders, so the game has only one package to read instead of 30. I like that discussion so far. The color scheme for the different classes is a nice idea, but maybe a bit “stict”? I agree the higher class should look different though. I also agree with FuruFuruu to not use too much color and pattern in clothes. Especially with the lower and middle class. Maybe sticking with “natural” leather and fabrics (non dyed or only dyed in one color) and use the colors and patterns as accent and for capes, scarfs, nicer dresses or shirts as well as accessories. @Nilxis So dark blue and dark green are natural hair color then? And the dyed hair is only for the higher class? And about the differences between the lower and middle class. Rather than colors or patterns I would say it should show more with the quality of the fabrics and stuff. And I could imagine the lower class (mostly farmers, fishers etc. I guess?) use more practical outfits while the middle class is more concerned about their looks. I don’t really mind if we use pointed ears or not. But I’m not a big fan of those big and sharp pointed ears. At least not for the Uranesians. But it seems everyone agrees on normal ears for the population? Do we stick with it then? It could be important for some accessories. I’m sure you plan giving them some supernatural power? – I could see them as fairies…but without the stupid wings (there is a mod which removes the wings if you are interested). Witches always have their (stupid) wand and werewolves and vampires or ghosts don’t really fit, do they? I don’t know. @ FuruFuruu – Thank you so much for taking the time and making this list!! I will take a closer look to your post the next few days. But I can already see that you put together quite the list. I actually already have a some (or more ) items. Kors Bra – I know you like that item, but I think the quality isn’t high enough? It looks a bit “cut” and shiny. About the accessories from Natali S – I like some of them (like the bamboo necklace, the spear pendant or the vial of blood pendant), but I think most of it don’t really fit for Uranesia. It’s quite modern… maybe too metallic? I know one can change the pattern, but it still doesn’t seem to fit. I do like the bracelets though. Is it just me or are these links empty? Well it's not really a problem, I could just copy and paste them. I like feather as accessories, but I think the “bigger” accessories or the skirt and the headwear are a bit much. Well at least I can’t imagine Uranesians wearing this. Maybe as a priestess on a festival or something or for a godess. But everyone has something different in mind. That’s only my opintion. BEOs clothes. I get why you like them – but a few of them are not of very high quality. To say it with RylandHomes words: It looks more like a “RL picture slapped onto a mesh”. I like the shoes from Gosik! But EA already has a few similar shoes, so I don’t know if we really need them? I'm going to post some CC addition too. I'll focus on hair and maybe add some more accessories. @ rkm28: And yes I think the skins you posted before might fit. #24 11th May 2017 at 1:07 AM Last edited by Nilxis : 11th May 2017 at 11:17 AM. For example something like plastic is easy to produce in a multitude of colors, but most natural materials don’t have these kind of vibrant colors and those that do are rare and coveted. So what people can do with dye other natural materials, is not the same as what one can do with paint or plastic, our more modern cheaper counterparts. That’s why in my other post I offered the opinion that colors should be considered especially with accessories. I know this is a fantasy world, but I just think the technological level of the civilization, class, environment, and natural resources should be taken into account. You both have a good point here. I agree that it would make sense to use really colorful clothes only for some accessories and more formal/festive outfits, for low/middle classes. So it’s like a earth-like tropical climate with hot days and warm nights and high humidity? In this case the clothes are really too thick I guess. I don’t think body sliders are that important for this project but the facial sliders definitely are. Yes! (Also white hair is natural). Dyed hair will be quite rare because there will be few higher class members in the city. Maybe geniuses would work too? I have to agree with you Chihara, about the Kors bra and some of NataliS' accessories. I would use the draped top only, which looks great. Well at least I can’t imagine Uranesians wearing this. I agree with this about big feathers too, yet, the small ones look fantastic! I liked some of BEO's dresses! The main problem I see, apart from quality, is that we could only use them with higher class women, so I would choose another piece of CC instead that we could use with a higher variety of sims, given that the list is small. I also agree we don't really need CC shoes. Lastly, guys, thank you all so much for the effort for finding stuff and linking it! I see many nice CC items with potential. I have to admit though, that I'm feeling a bit overwhelmed by all these links, so, excuse me if I don't comment on all of them Remember that because the list is short we should be able to use the CC on many of the sims, so if an item would only be suitable for the king, or the queen, we should give priority to other stuff. Keeping this in mind, remember that you are the ones who will create most of the Sims, so it's you who should have the last word in this so I trust you will make great choices I'll be here to comment but I don't have a lot of time so I apologize if I miss something, let me know if I do! I opened up my game and took pictures of the recolors inside and outside of CAS. To me they are salvageable and look loads better recolored. Wtf is up with this^^?!? I am really bothered by how he looks outside of CAS. I don't think it's lighting issue because I checked him in all light. I mean look at Aditi and look at him. You literally can see no details?! I've made tons of dark-skinned sims, but I've never had the washout issue be this severe. I really think this is a skin issue. Perhaps the skin doesn't have enough contrast? So maybe I'll have to focus on that when I make a skin. Any suggestions ? Please don't say make him lighter because that's not happening. I'm going to see if I can find some help with this. Hey guys! Sorry for the late reply. I'm going to try to make this quick. I still have so much to post. I will be on that. I have not forgotten. I still want to update my CC list post and also post some examples of the accessories, and updates to my own sims. First and foremost, thank you for posting this list! Of course! No way I wouldn't post VenusPrincesss?! Her stuff is amazing! Also I would add all of BEO's White Collection items to the list not just the draped top as the skirt would be an excellent addition to the clothing list for female sims: https://www.thesimsresource.com/dow...-01/id/1263964/. I agree. I actually have that on my list. But for whatever reason I didn't put down a link. I got a little overwhelmed myself . As far as the feather's on your list, I'm not against them, but I was looking at smaller ones because most of the feather featured in cyberzombieprincess' design are small. I actually really really like those feathers for the inaccessible island. I think they would look fantastic on them. The footwear, I'm torn. I like a lot of them (In fact I downloaded some ), but some of them look very similar to me to what's already in the game. I don't know you guys can decided. It's not about me, it's about everyone and like I said I do like them, it's just they are very similar. I really cannot wait to see your sims. You sound like you know what you're doing and I cannot wait to see the result! I like this idea! I could definitely see some of the gods with this look. First and foremost my friend, could you please please find that skin you used for the Nanuk family and link it lol. Please . I know you're a busy lady (so am I) but if you get a chance please. M*****f***er don't act modest lmao. I'm not Kendrick Lamar, and have not once told you to be humble. You know you got down with those sims. And yes you surpassed me. Here have them *hands you all the sims* you can have all of my sims and make them in your image. I will take a closer look to your post the next few days. But I can already see that you put together quite the list. You're welcome. I'm glad you guys appreciate it . It took me soooo long to compile it. Clothing: Kors Bra – I know you like that item, but I think the quality isn’t high enough? It looks a bit “cut” and shiny. You're right . Lol. I'm going to see if I can find something of a comparable look but of a higher quality, but you are absolutely right. trust me they will look heaps better once you see what I'm talking about. Maybe I can win you and Nilxis over. Meh, it's worth a try . I agree with you on the body sliders, that's why in my CC Lite list they aren't there. However I had to post them in the other list, because I used them on my sims. Could you please, if it's not too much trouble, post your revamped Ephemera skin? Got you... but I think that may be a problem because I mentioned mermaids and gods in the other thread . I'm sorry. I couldn't help it. I was too excited and I couldn't control myself lol. I was actually talking to cyberzombieprincess about dive lots and mermaids and she was talking about a mountain lake water god/goddess . ^^^This all of this is also mentioned... Sorry. For that matter, are there going to be fairies, werewolves, vampires, genies, and mermaids outside of god-dom? I like fairies, genies, witches, mermaids and ghosts. I'm not particularly crazy about vampires and werewolves, but like I said in the post in the other thread, I could see them working. If there were one or a handful (all of them living outside of the city in the mountains) and there was some lore written that explains them. I know this part is overwhelming because there is so much CC that's posted. I honestly wouldn't even know how to tackle this because so many people want so many different things. But I am hoping we can be like Geth and reach a consensus. Pretty much everything you liked plus some. I actually really liked all of Chihara's face paints, but I understand you want the inaccessible island's peeps to be more tribal so as to set Uranesians apart. I have to agree with you Chihara, about the Kors bra and some of NataliS' accessories. I'm going show you guys NataliS necklaces with different textures and if you don't agree, cool, let's scrap them. But I'm telling you, with some adjustments they can work. Remember that because the list is short we should be able to use the CC on many of the sims, so if an item would only be suitable for the king, or the queen, we should give priority to other stuff. I'm glad you mentioned this because I was not even thinking this, so I'm going to start taking this into account. Talk about motivation. It's so amazing that you are so open to us and allowing us so much freedom in this, but not only that, trust, because this is ultimately your world, but you're willing to hand a piece of it over to us. Wow. Thank you Nilxis. Thank you for being such an awesome and open creator.